Ladbrokes are a household name for betting across the UK with their betting shops in every high street. You would certainly expect an impressive and well designed site from a leading company like this. You won’t be disappointed at all by their Bingo presence .Their sites like the other main site operators use Virtue fusion software, and the overall site structure and game quality is very impressive. The Game of Bingo is played and enjoyed all around the world , and especially in Australia .With Ladbrokes recent acquisition of Bookmaker.com.au Ladbrokes has entered the Australian sports betting market in a big way .It has launched Ladbrokes.com.au as part of its move to expand its online presence in Australia. This we are sure is just the start of an exciting new period, in the Australian Bingo and gaming world. The site has a pleasant and welcoming feel and the onsite navigation is easy to master and very user friendly. From the lobby you will quickly be able to reach your favourite room and settle down for a great game .They have put a lot of work in the design of the site ,and you can’t miss their regular rotation of specials deals and offers as we’ll see in our Ladbrokes Bingo review. They have a entertaining selection of themed Bingo Games ,featuring many well know personalities from the world of entertainment calling the numbers .Like any Bingo site, games are played in ‘rooms’ and at Ladbrokes, these are given actual room names, like the, Bedroom, Basement, and Attic. The graphics are very clear, and the sound effects are pretty realistic. The friendly Chat Moderators are always on hand to keep things lively and make you feel you are amongst friends. As you would expect from the Team at Ladbrokes they have gone all out to provide a huge array of games. There are all the popular 75 ball 80 ball and 90 ball, games as well as a great selection of multiplayer bingo games .The multiplayer games can build up huge prizes, last year one happy punter won an incredible £1.2million at Ladbrokes Bingo. When you need a bit of a break from the bingo action there are loads of slots, roulette and other side games like Big Blue to keep you enjoying yourself the whole time. 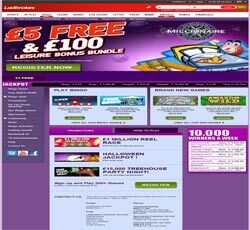 Ladbrokes Bingo always tries to ensure that its welcome offers are some of the best around. Currently Players can enjoy a free £5 no deposit bingo bonus until 30th December 2013. To receive this bonus enter FREEFIVER after registering your chat name on the site and the bonus will appear within hours .Then deposit a minimum of £10 and spend it in one of the specified rooms to trigger a £20 bingo bonus. That process can be completed up to five times in over 5 different bingo rooms, releasing up to £100 in bingo bonus. Customer support seems very quick and responsive and is possible using ‘live chat’, phone or email. Ladbrokes has a well deserved reputation for fast payout across all its sites and operations .You can use all the standard payment methods including credit/debit card, neteller, UKash and they are one of a very few sites that accept payment though PayPal. .Money transfer is private, quick and totally secure. From this Ladbrokes Bingo Review, I heartily recommend Ladbrokes Bingo, as the place to play your online Bingo. It’s friendly and inviting atmosphere, plus some of the best online games, with lots of great Jackpots for the lucky winners means you can’t lose. Sign up today and we are sure you will soon be having fun all the way at Ladbrokes Bingo.